The people of the Nordic countries have a passionate, deeply rooted relationship with coffee. So deeply rooted, in fact, that it is rarely spoken about, and rarer still, given serious thought. It is accepted as a matter of course, a part of the cultural fabric, and – in a more narrow sense – a culture unto itself. The site is supported by Wilfa, a Norwegian based housewares and lifestyle company, but aside from a small logo on the site, their presence is non-existent. It’s nice to see such a respected collection of voices talking about coffee with consumers in mind, instead of geeking out exclusively with others in the coffee industry. Congrats on the launch and I’m looking forward to a future filled with great content. I have been working with Wilfa for a long time now to help them improve and develop some new coffee brewers. (To be launched at this years Nordic Barista Cup). 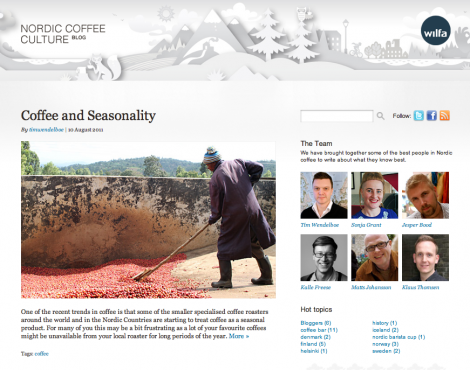 In this process we felt there needed to be a blog to celebrate the Nordic Coffee Culture. Thanks for the supporting comments.